The Mamanuca group comprises twenty volcanic islands sprawled along Fiji’s western coast. These speckles of paradise offer everything you would expect from a tropical island; picture postcard beaches, myriad colourful reefs and world-class surf. There’s also a range of fun activities to suit everyone from couples and partygoers to families. Malololailai is the second largest island and is very popular with yachters. It has a fine marina called ‘Musket Cove’, which hosts the famous Fiji Regatta Week every September, attracting sailors from all over the world. There is a vast range of water sports available on Beachcomber Island and it offers some of the best snorkelling and diving opportunities in the archipelago. 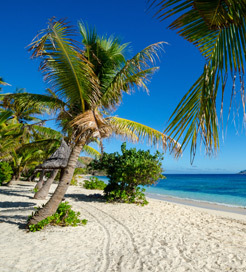 It also has plenty of beach cocktail bars and a fantastic nightlife, with it commonly regarded as the ‘party island’. Monuriki Island is a must for any movie buff, as the 2000 Tom Hanks film, ‘Cast Away’ was shot here. Despite its popularity among tourists, it still boasts stunning, unspoilt scenery and a wide, crystal clear lagoon. The islands of Namotu and Tavarua are a haven for surfers, with a few private resorts aimed towards the American market. The Fijian cuisine centres mainly on fresh seafood. However, it brings influences from Indian dishes due to the large number of labourers brought to the islands in the late 1800s. ‘Kokoda’ is a local delicacy, consisting of raw fish marinated in lemon and coconut milk. Fresh tropical fruit is also very popular, so be sure to try the local plantain, papaya, mango and pawpaw. The mainland Fijian port of Denarau offers ferry routes to most of the Mamanuca Islands. The crossings are provided least once a day and are operated by Awesome Adventures and South Sea Cruises. Both companies provide high-speed catamarans with large sun decks, allowing you to admire the gorgeous scenery. For more information, please visit our Ferries from Fiji to Mamanuca Islands page.